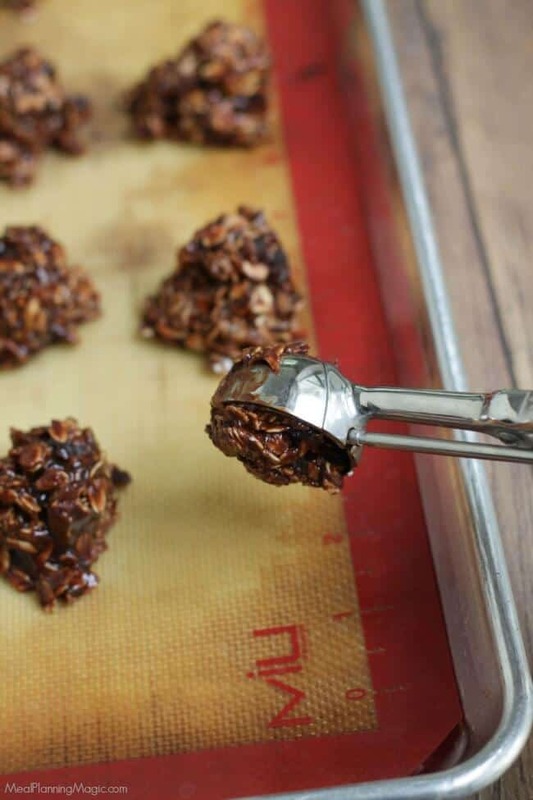 No Bake Chocolate Cherry Snack Bites are easy no bake cookies, made using just a few simple ingredients, including dried bing cherries, chocolate, and rolled oats! Over five and half years ago I did a review for Naturebox snacks, a snack subscription service. They were just starting out and the idea of receiving wholesome, healthy snacks once a month sounded like a neat idea, especially for someone who doesn’t have a large selection of healthy food stores near them. It would even make a great gift! 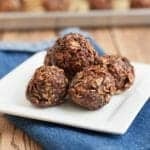 I thought it was time I shared this No Bake Chocolate Cherry Snack Bites recipe with you all again. They have several recipes on their website using some of the snacks in their boxes and that’s when I first tried dried cherries. Now we buy our dried cherries at Costco and they’re one of my husband’s favorites to snack on alone or mix in with granola. The combination of cherry and chocolate has always been one of my favorites like these Cherry Chocolate Cutout Sugar Cookies, Chocolate Covered Cherry Delight Cookies, Black Forest Brownies or Cherry Chocolate Kiss Cookies. There are lots to choose from! 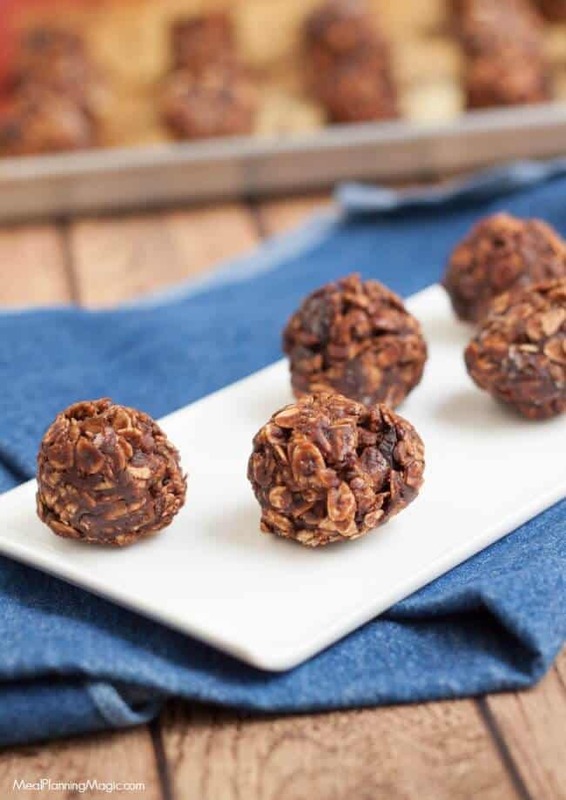 I love that these No Bake Chocolate Cherry Snack Bites are full of all-natural ingredients like whole grain oats, banana, cocoa powder and peanut butter, plus dried cherries of course. Somehow these flavors all just seem to work really well together! I have modified the original recipe slightly to reduce the sugar slightly and a couple of other small changes to make them a bit more healthy. You’ll want to store these in the refrigerator so they stay fresh. You can store them up to a week in the refrigerator (if they last that long!) They are so easy to make and freeze well too so you can make a big batch to have on hand any time! 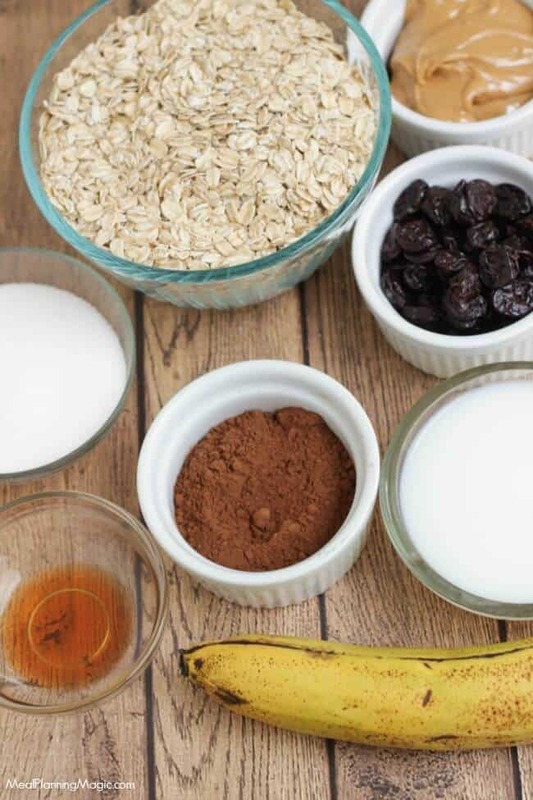 These little bites of chocolate, oats, cherries and bananas are just enough to satisfy that sweet tooth--a little more naturally! in a medium saucepan, combine sugar, milk, peanut butter and cocoa. Continue to stir over medium heat until it comes to a slow boil. Allow the mixture to boil for about one minute and then remove from heat. 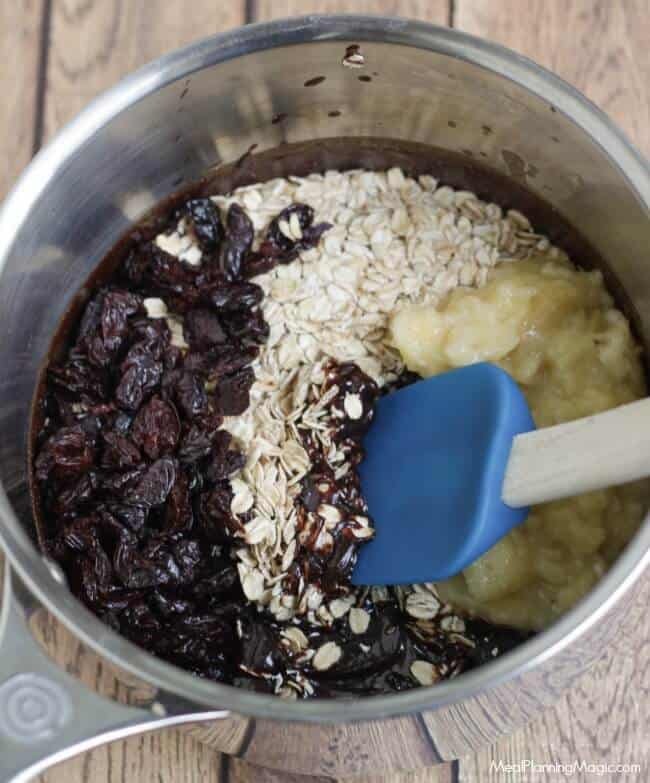 Let the mixture cool for a minute or two, then add in the oats, banana, vanilla, and cherries and stir to combine. Using a mini cookie dough scoop, drop scoops onto a cookie sheet covered in waxed paper or with a silicon baking mat. Cool to room temperature or refrigerate. Store in refrigerator for up to one week or in freezer for up to 3 months. If you are using just the scoop, your bites will come out a bit more blob like. That is ok! But if you want them to look more roundish, use a scoop then roll with your hands and place on lined baking sheet to cool before storing. 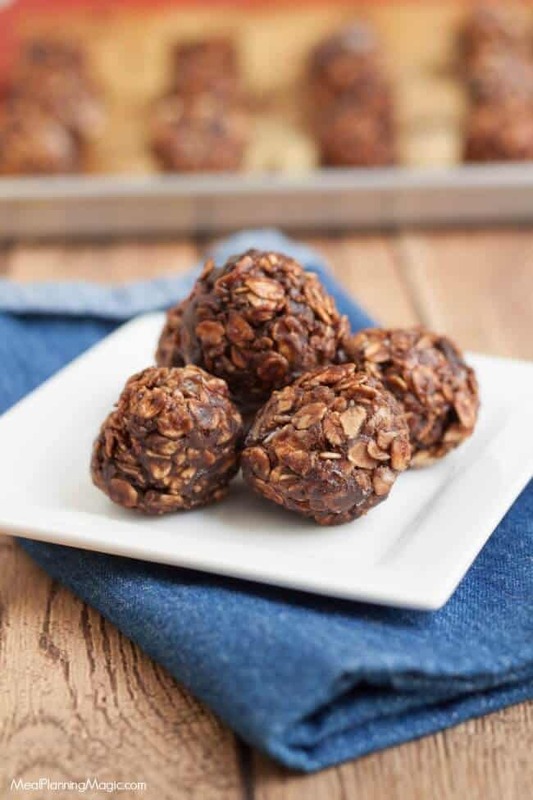 For more snack bites like these No Bake Chocolate Cherry Snack Bites, be sure to check out my Cinnamon Raisin Peanut Butter Energy Bites or Peanut Butter Chocolate Energy Bites! We like apple cartwheels: core an apple and stuff with a mixture of peanut butter, touch of honey, chocolate chips and raisins. Slice into four or five pieces- it works best if you put in fridge for about an hour to let the filling firm up a bit. These hold up great in the lunch box wrapped in tin foil or in a small plastic baggie. Homemade granola is one of my favorites! We love all the fresh fruits and veggies available this time of year,right now we are snacking on white peaches and purple plums. We like grapes and walnuts. In the summer any fresh fruit. I like naturbox on facebook. Dried Mango!! And other dried fruits or granola even! We like “green” smoothies or yogurt parfaits. Hummus and celery is a great healthy snack for my family! I like you and Naturebox on Facebook too! Thanks so much! We love cottage cheese with fresh peaches! Liked both on Facebook as Elena V.
Trail Mix is my favorite healthy snack loaded with dried fruits and raw nuts! I like you & Nature Box on Facebook too! I like to snack on Greek yogurt plain with fresh or frozen berries mixed in! 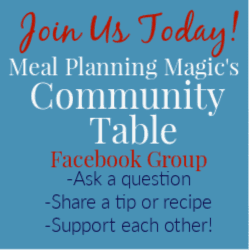 Like you & Nature Box on FB! We eat a lot of fruit. Also, air popped popcorn. I love to give my family veggie stick and hummus as a healthy snack. I also make my own trail mix with raw nuts and seeds and no sugar added dried fruits.